I'll be giving a talk tomorrow night at the Schusev State Museum of Architecture at 6PM tomorrow evening (Saturday June 9th). 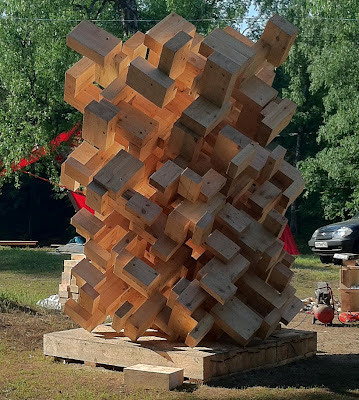 I'll talk about my art work, the project I just completed, as well as share some thoughts on architecture and what it means to modern (or unModern) at the moment. I was invited as part of an effort to make some small connection back to the Russian Futurists. But what has been most striking has been how very different a project it is to be modern than is a was to be a hundred years ago. 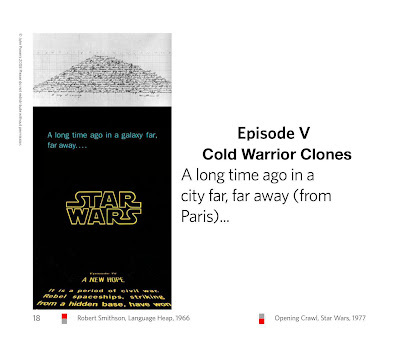 Those early revolutionaries were working from small, shallow data sets. Today our worlds are just as fraught and confusing, but we robust data to mine and refine. Please spread the word. 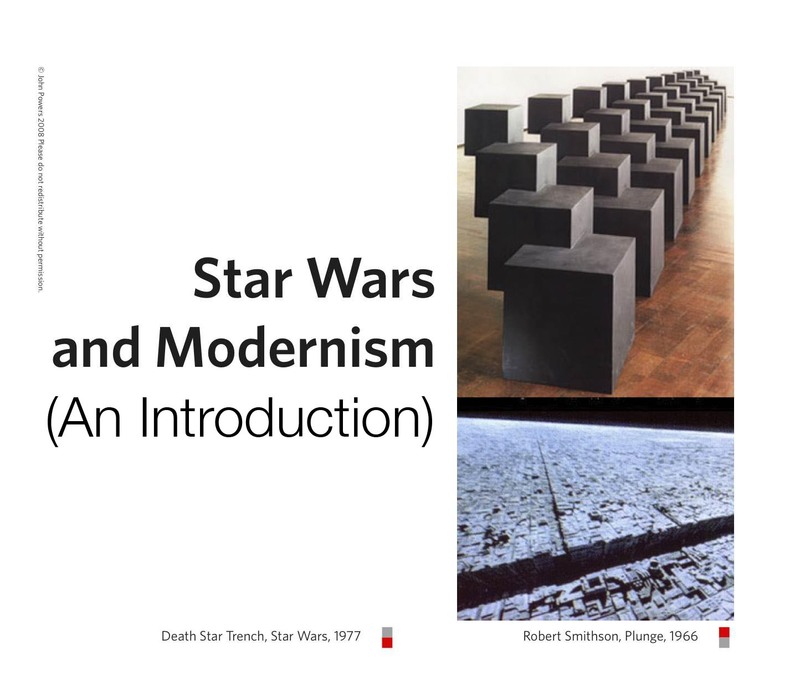 Below are the slides for the first of a three-part, "8-bit", art history lecture on Star Wars and American Cold War Modernism I gave via Twitter. (Return to Introduction for more explanation.) 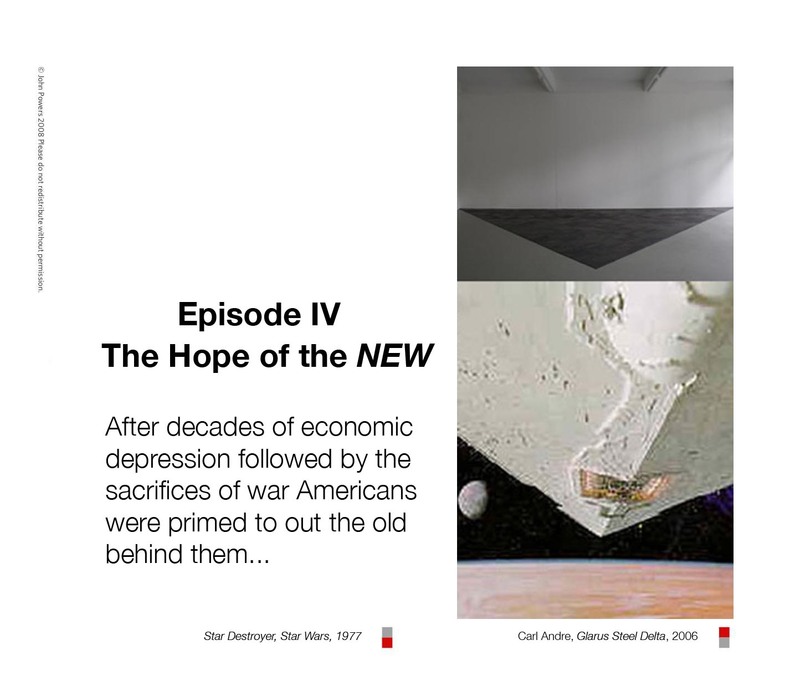 I have added text to this episode to introduce some of the charicters and texts that are referenced in the "slides." 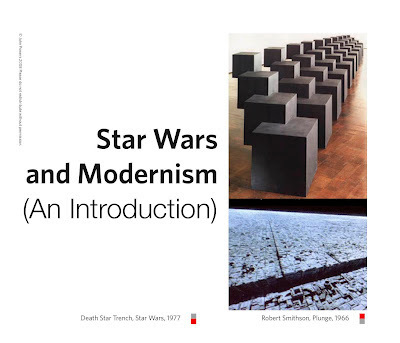 Earlier this week on twitter I 'tweeted' what might be thought of as an 8-bit art history lecture. By "8-Bit" I mean that, in the same way an 8-bit portrait is accurate, if radically simplified, this is a blocky generalized history. 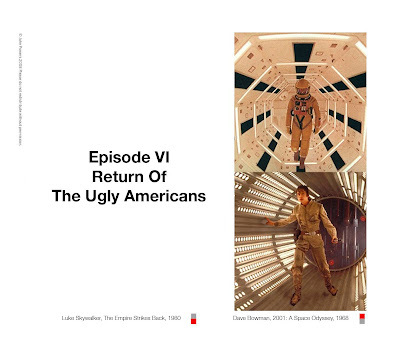 I was spured to give this lecture after Todd Florio passed on the artist, Tom Sachs' observation that "Darth Vader IS Hitler. Yoda IS Buddha." Sachs owns Foamcore, police barricades, and can make an almost entirely air-tight claim on NASA, but Star Wars is mine. Sorry Tom. The "slides" I tweeted yesterday come from a "primer" I assembled as a joke while working on an essay for Triple Canopy a few years ago. Just as Florio spurred me to tweet, Dan Phiffer has spurred me to blog (he assemble the tweets into a blog post before I had a chance to, happily forcing my hand). Just as I broke up the tweet-lecture into three parts, I'll repost the slides here in three "episodes," starting with Episode IV (you haven't missed anything, thats where it starts - and no, there will be no be prequels). For twitter I introduced each slide's link with a short phrase, which would be a little redundant here. Taking advantage of the blog format, I've added some text to this intro and Episode IV that explodes twitter's 140 character limit. Like all lecturers, I look forward to questions and comments. 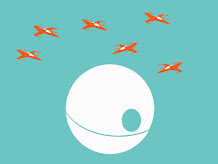 For those interested there is also an archive of my posts on Star Wars here. Enjoy. 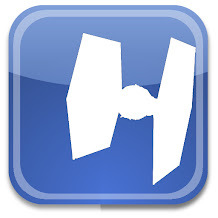 For some tie I have wanted to build an archive that would allow those interested to quickly search through old posts. Seeing how Sha Hawng was using Pinterest to reblog SWM posts inspired me to use that platform as a visual archive. So far I've created a number of "boards" each dedicated to a general subject. It isn't a perfect solution, but it seems to be a pretty good one. 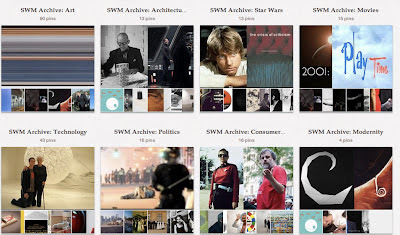 You shouldn't need to be a member of Pinterest to view the boards - if anyone does have any trouble navigating the Archive, or suggestions on how it could be improved, I hope they will comment either here or on my Pinterest page.